To celebrate the Year of the Dog, “Akita Dog 101 (Wan Oh Wan! )” with guest lecturer Steven Takamatsu, president of Akita Inu Hozonkai, L.A. Branch, will be presented on Thursday, March 8, at 7 p.m. at the Japan Foundation Los Angeles, 5700 Wilshire Blvd., Suite 100 in Los Angeles. An Akita dog, originating from Odate in the prefecture of Akita, is quiet, strong and loyal — also very cute. Helen Keller had one. Russian President Vladimir Putin loves them, as does Russian figure skating gold medalist Alina Zagitova. They are also loved in Odate, which is the hometown of the faithful dog Hachiko (Hachi), known by a statue in Shibuya Station in Tokyo. 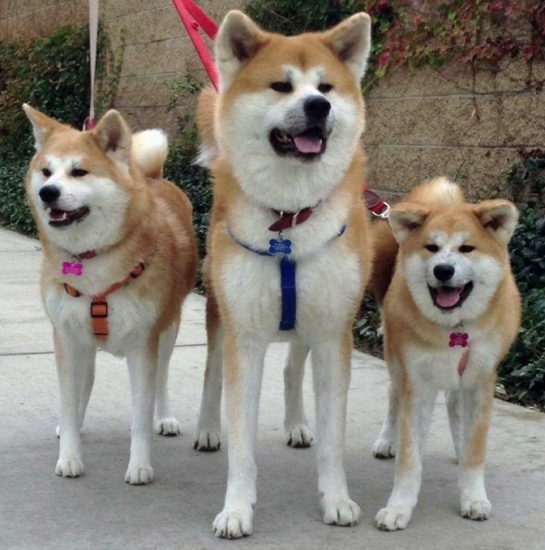 Takamatsu will explain the basic history of the Akita dog in U.S., his characteristics and charms, and differences between Japanese Akita and the American Akita as two separate breeds. Takamatsu was born and raised in the Inland Empire and currently resides in Fontana with his wife, Judy, and eight dogs (six Japanese Akitas and two Shibas) and works as a dentist in La Verne. Seventeen years ago, he got his first dog, an American Akita male, without knowing the differences between American Akita and Japanese Akita. After attending a pet expo and meeting a Japanese Akita through the AKIHO booth, he got his first Japanese Akita female, Yumi, in 2002. Since then he has been a member of AKIHO, North America Branch. He and Judy have been showing Akitas and Shibas in conformation shows for 16 years and been breeding Akitas for seven years. He has been president of AKIHO, North America Branch since 2007 and has been visiting Japan consistently for the past three years to connect with breeders and headquarters officials to stay informed of any new developments and changes in the breed. Apart from his interest in dogs, he likes gardening, cycling and reading sci-fi books. This event is being held in conjunction with a preview night for “Helen Keller and Hachiko,” which will be on view from March 9 to 23. The curator, Yumi McDonald, will also speak. Admission to the lecture is free but RSVP required. For more information, visit www.jflalc.org. Left: Helen Keller (Perkins School for the Blind Archives). Right: Statue of Hachiko in his hometown, Odate City, Akita Prefecture. Helen Keller (1880-1968) loved Hachiko. 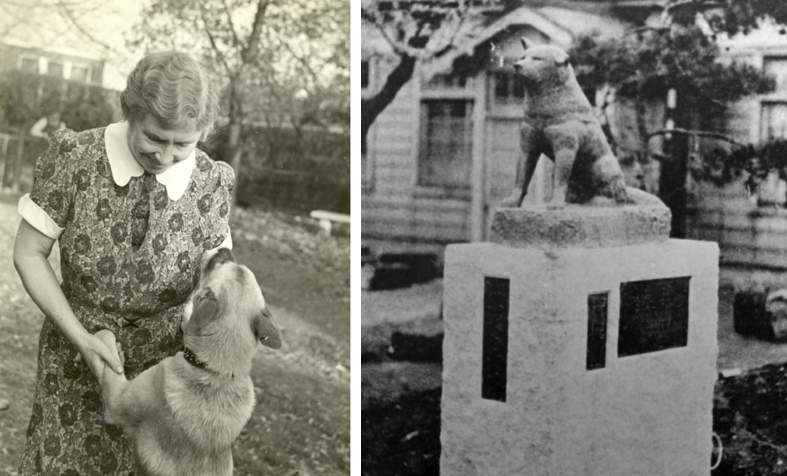 When she visited Japan in 1937, she was given an Akita puppy from people in Akita. The exhibition introduces much less-known relations between Keller, Hachiko and her Akita dogs. McDonald’s mother used to live in Shibuya and as a little girl saw Hachiko on a regular basis. She will exhibit pictures of 1930s Tokyo life personally taken by her grandfather. The exhibit includes the children’s books her mother read, a 1930s Shirley Temple doll and the October 1948 issue of Mainichi Graphic. A fascinating picture of Keller touching the statue of Hachiko was published in this old magazine. After the exhibition in Los Angeles, the magazine will be donated to the Shibuya Folk and Literary Shirane Memorial Museum. This exhibition is a rare opportunity to look at the pictures collected from Tokyo, Akita, New York, Boston and Westport, Conn., where Keller used to live. Hachiko was born in 1923. At the age of 8 weeks, he was adopted by Professor Hidesaburo Ueno, a faculty member of the Agricultural Engineering Department at the Imperial University of Tokyo. Ueno suddenly passed away at the university on May 21, 1925. Hachiko searched for his master desperately and returned to the same spot in front of Shibuya station to look for his master. Mrs. Ueno understood that Hachiko missed Professor Ueno so much. She asked their former gardener, who lived near Shibuya station, to keep Hachiko. From then on, Hachiko traveled to Shibuya station in the mornings and evenings from the gardener’s house to wait for his former master. He continued to do so every day, rain or shine, for nearly 10 years until his own death on March 8, 1935. Admission to the exhibition is free. Hours: Monday through Friday, 10 a.m. to 7 p.m.; closed weekends.